3D printing is no more an alien technology. A large number of people including hobbyists and industry insiders know the 3D printing technology inside out but many people still don’t understand the basic difference in the technologies used in printing. The output of 3D printing may seem similar to majority of us but only an expert eye can spot the difference. Without confusing you further, we present you with an article that helps you understand the difference between DLP and SLA. DLP stands for Digital Light Processing. The DLP process shares some similarities with the Stereolithography 3D printing process where photopolymers are used. 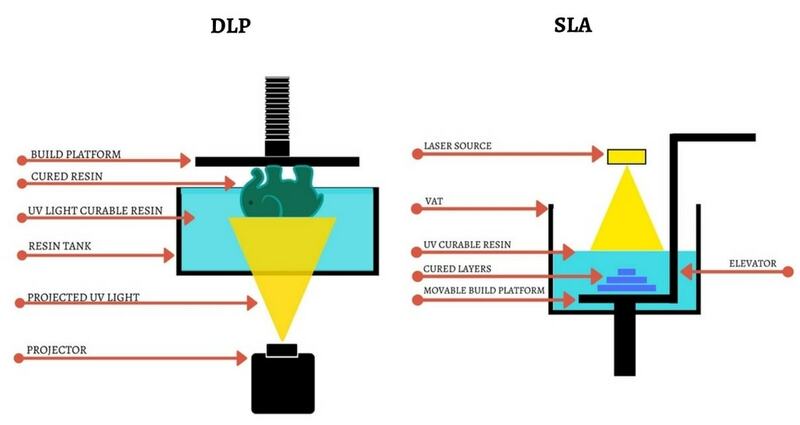 The DLP 3D printing technology uses a conventional light source like an arc lamp with a liquid crystal display panel. In DLP printing, the vat of liquid polymer is exposed to UV light in safe conditions. The process starts with sending of the 3D image to the printer. An in-built projector that sits under the resin container projects slices of the 3D image on the resin layers. The first layer of polymer that is exposed to the UV light hardens and the process continues to the 2nd and all successive layers in the photopolymer. The process continues until the 3D model is built. SLA stands for Stereolithography. It is the oldest 3D printing technology that is still used today. Unlike DLP, the SLA 3D printer uses a laser beam to harden the polymer. The SLA 3D printer directs UV laser to two galvanometers which directs them to correct X and Y coordinates that are traced out to a cross-section of the model. The UV laser beam moves continuously across the print are hardening the photopolymer as it goes. The 3D printing process breaks the 3D design into multiple sets of coordinates for each layer along the lines that are sent to two galvanometers. The primary difference between DLP and SLA is the light source; SLP uses a UV laser beam while the DLP uses a more UV source light. In DLP, the UV light source remains stationary and it cures the complete layer of resin at a time. In SLA, the laser beam moves from point X to point Y on one resin layer. After one resin layer is cured, it moves to another layer. The DLP 3D printer works faster and cuts down the 3D modeling time significantly. In DLP 3D printer, the operator can control the intensity of UV light source and thereby control its effect on the resin by variables. In SLA, the intensity of the laser beam cannot be adjusted and you have to change the laser light completely for different resin effect. DLP is more suitable to build one-off small and intricate part while SLA is more suitable for printing several intricate parts in one go. DLP is useful in quickly printing large part without much detail while SLA is perfect to print a large part with intricate details.